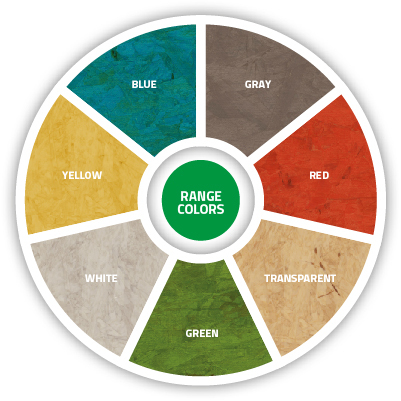 OSB Colors is a decorative panel used for interior design, furniture, trade fair stands and flooring. OSB Color is produced using the exclusive Bonzano OSB/3 panel made entirely of poplar obtained from certified plantations, with No Added Formaldehyde (compliant with NAF standards). In the Kids version the product complies with European standards on chemical emissions in toys. OSB Color is also water-repellent and suitable for outdoor applications*. OSB Color Kids meets chemical safety requirement standards for toys! OSB COLOR complies with EUROPEAN STANDARD EN 71-3, the strictest Toy Safety standard in the world. On the basis of the provisions of EN 71-3, toys must be designed and built to prevent exposure to hazardous chemicals that could be harmful to humans. In particular, the European Directive requires that all the materials used in the production of toys are analyzed in strict tests that simulate the material coming into contact with the acids in the stomach, introducing notable limits in terms of toxic emissions and the use of carcinogens, mutagens and substances that are harmful for reproduction.